The New York Yankees have always been known to “buy players”, in other words the Yankees have never been afraid to jump in and make major splashes in regards to free agent spending. However, the Yankees did have major success in the farm system in the mid 1990s era. 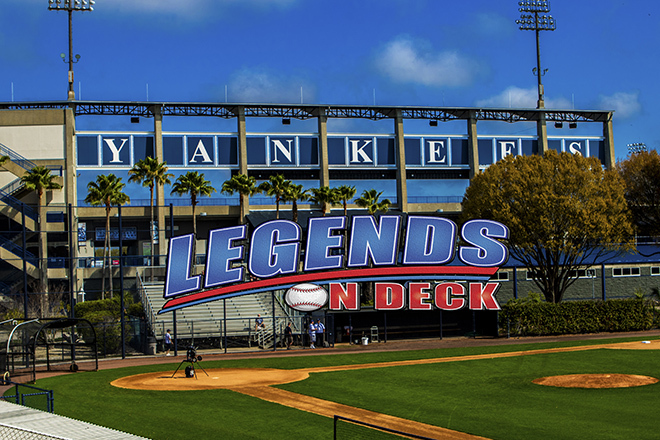 They built around the core 4– Derek Jeter, Andy Pettitte, Mariano Rivera and Jorge Posada. Had Bernie Williams not retired early, we may have added him to that class. Fast forward to 2016, the Yankees golden era seems like its come to an end. The 2016 season has been filled with struggles, but they may have the pieces to build from the farm system once again, in the near future. Led by Aaron Judge (OF), Gary Sanchez (C), Greg Bird (1B), and Rob Refsnyder (2B), the Yankees future looks bright. With below average production from the Yankees shortstop, the answer may be in Tampa, Florida. The Tampa Yankees hold several top prospects, but one Latin American stand out. Ranked #1 is shortstop Jorge Mateo who was signed out of the Dominican Republic and the Yankees are no strangers to international Latin signings as Luis Severino, young MLB starter, was also signed out of the Dominican Republic. On May 22, 2016 I spoke with Mateo about his journey through baseball and the Yankees organization. Unfortunately, the Captain’s playing days are over, but for Mateo this was just the beginning. He spent his first two years as a professional baseball player in the Dominican Summer League. While in the DSL, his average hovered around .280 with 8 HRs and 34 RBIs. What truly set him apart was his impressive athleticism and quickness. In 78 games, Mateo recorded 53 stolen bases. From that moment forward, Mateo made it clear he had all the tools to be a force in the league. His bat really came alive in the latter part of the 2015 season, hitting .268 while playing for Charleston, but when called up to play for the Tampa Yankees he lit up George Steinbrenner Field batting .321. Once Mateo gets on base, a stolen base is almost a given. He racked up an eye-opening 82 stolen bases in the 2015 season, which would lead the Minors. He would look to put up similar numbers in Tampa. As May comes to an end, Mateo is playing at an even higher level than before. Batting .313 (3rd), with 5 HRs (2nd) and 27 RBIs (T-2nd), Mateo is at the top of most offensive categories for the Tampa Yankees. Not to mention, he’s ranked 2nd is stolen bases in all of the Florida State League with 15 steals in just 41 games. Mateo has all the tools to be the future long-term star as the New York Yankees shortstop. It is very unlikely we see him in the Majors this year or even next with Didi Gregorius there now, but Yankee fans should all be screaming “Hip-Hip-JORGE!” in excitement about the future with Mateo in the pack of new comers.